If you’re the kind of person who has friends, and/or leaves the confines of the basement from time to time, we hear that these “Escape Rooms” are all the rage. Basically you get locked into a room with a couple other people and have to solve various problems and puzzles until you’ve finally made enough progress that they let you out. Which actually sounds a lot like the working conditions here at Hackaday HQ, except they occasionally slip some pizza rolls under the door for us which is nice. Whichever side you find yourself on in one of these lighthearted hostage situations, knowledge of this multi-tag RFID lock created by [Annaane] may come in handy. By connecting multiple MFRC522 RFID readers to an Arduino Uno, she’s come up with a method of triggering a device (like an electronic door lock) only when the appropriate combination of RFID tags have been arranged. With a little imagination, this allows for some very complex puzzle scenarios which are sure to keep your prisoners enthralled until you can lower the lotion down to them. Her code allows you to configure the type and number of RFID cards required to trigger one of the Arduino’s digital pins, which usually would be connected to a relay to fire off whatever device you want. The Arduino sketch is also setup to give “hints” to the player by way of a status LED: fast blinking let’s you know the tag scanned is wrong, and slow blinking means you don’t have enough scanned in yet. The video after the break shows some highlights of the build, as well as a quick demonstration of how both the RFID “combination” and manual override can be used to trigger the attached relay. Hackers do love RFID. Using them for physical access control is a fairly common project around these parts, and we’ve even seen similar setups for the digital realm. In a recently updated post, [Codex99] has a detailed history of the HP-35 pocket calculator. Unless you are a certain age, you probably don’t think much of calculators. They are cheap and not very essential in this day of cell phones and PCs. But in the 1970s they were amazing technology and the desire of every engineer and engineering student. The story opens in 1965 when Tom Osborne — who was not an HP employee — build a floating point calculator he called the Green Machine. Apparently, he had painted the balsa wood case green. He had been showing it around but failed to get any interest until he showed it to Bill Hewlett. Hewlett wanted it to do trig functions and offered him a six-week consulting gig to work on improvements. HP engineer Dave Cochran helped out and also helped envision making the device keystroke-programmable. By 1968, this collaboration led to a 40-pound desktop calculator — the HP 9100 — that was the size of a typewriter. It could be yours for only $4900. Keep in mind, that same amount would buy two brand new cars in 1968. The dumbest thing this week is Uber’s flying car concept of the future. The braintrust at Uber envisions a world of skyports, on rooftops or on the ground that will handle 200 takeoffs and landings per hour. That is 4800 per day at a maximum. The record for the number of total takeoffs and landings for any airport was set last year at Mumbai’s Chhatrapati Shivaji airport with 969 takeoffs and landings in a twenty-four hour period. Yes, Uber wants to put the world’s busiest airport in a parking lot or something. Just wait, it gets dumber. Uber’s ‘flying car’ looks like a standard quadcopter, but with stacked, non-contrarotating props, for safety. These aircraft will be powered electrically, although it’s not quite clear if this is a hybrid setup (which could actually be practical now, but without regulatory precedent) or something built around an enormous battery (impractical for anything bigger than a 152 in this decade). This aircraft is just a render, and Uber expects it to be certified for commercial flight in two to five years. This is nearly impossible. Uber plans to fly these aircraft autonomously. This will never happen. Additionally, Uber will not manufacture or design the aircraft. Instead, they will partner with a company that has experience in aerospace — Bell or Embraer, for instance — making the render a moot point, because ultimately Uber is just going to go with whatever Bell or Embraer have on the drawing board. Uber’s entire business plan is “move fast and break laws”, which will not serve them well with the FAA. The mere mention of Uber’s self-flying car has lowered the level of public discourse and has made us all dumber. Here’s a great example of how cheap TVs are getting. [tmv22] built a 55 inch, 4k digital photo frame for $400. The TV was one Walmart was blowing out for two hundred and sixty dollars. Add in an Odroid C2 and some various cables and hardware, and you have an absurd digital photo frame for a few benjamins. Espressif is getting investment from Intel’s venture capital division. Espressif, is, of course, the company behind the incredibly popular ESP8266 and ESP32 chipsets designed for the Internet of Things. 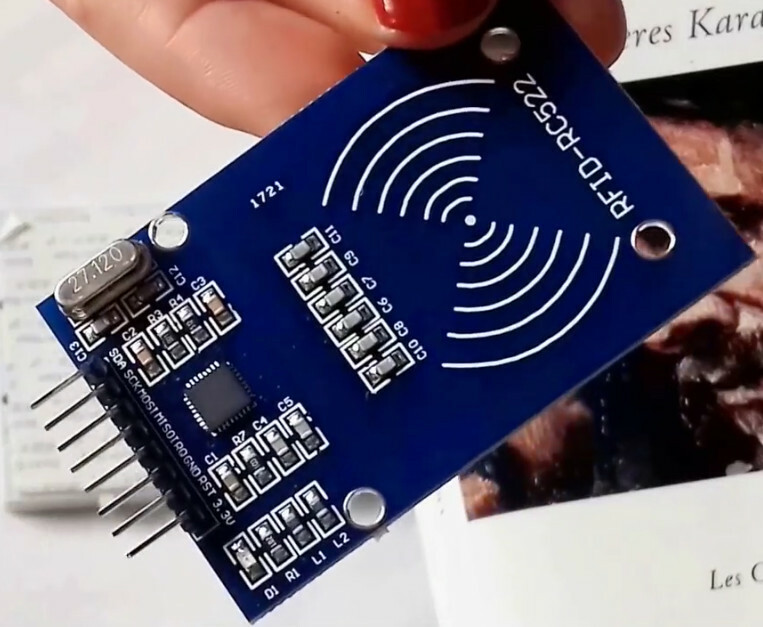 Before the ESP8266 module popped up for sale on SeeedStudios, no one had heard of Espressif. Intel, on the other hand, is the largest semiconductor company on the planet and recently exited the maker IoT space because of the complete and utter failure of the Curie, Joule, Edison, and Galileo product lines. I would bet a significant portion of Intel’s failure was due to their inability to release datasheets. Awesome news for synth heads. Behringer is cloning just about every classic synth and drum machine. At Superbooth 2018, Behringer, manufacturers of the worst mixers on the planet, revealed their clone of the Roland SH-101 synthesizer. It’s called the MS-101, and yes, it has the keytar grip. Also announced is a clone of the TR-808, Odyssey One, the OB-Xa, Arp 2600, and M100 modules. Here’s some context for you: a good Detroit techno show consists of an SH-101, TB-303, TR-808 and TR-909, all made by Roland in the 80s. These vintage synths and drum machines, at current prices, would cost about $10,000, used. The prices for these clone synths haven’t been announced, but we’re looking at a Detroit techno show for $1000. That’s nuts. Here’s a video of the 808. As you may have heard, the U.S. is in the grips of an opioid epidemic. Overdose deaths from heroin, oxycontin, and fentanyl have quadrupled since 1999. The key to detecting opioid overdose before it’s too late is in monitoring respiration. Opioids in particular cause depressed respiration, which is slow and ineffective breathing that’s inadequate for the gas exchange that keeps us alive. Depressed respiration becomes fatal unless the patient is given nalaxone, an antidote that works by blocking opioid receptors in the brain. [Curt White] is developing an intra-oral device to prevent opioid overdose via early detection. It tracks a patient’s inhale/exhale rate and sends the data over Bluetooth to an open-source website. The tiny device uses an air pressure sensor, a humidity sensor, and a thermopile thermometer to accurately track a person’s full respiration waveform whether their mouth is open or closed. The brain is one of [Curt]’s hacked $35 activity trackers that we told you about a few days ago. All of the hardware including the battery is embedded in a custom retainer made from thermoplastic. [Curt] used Tyvek and surgical tape to isolate the air pressure sensor. Both are waterproof and breathable, which means that air can get to the sensor, but not saliva. Hold your breath and click past the break to watch [Curt] demonstrate this amazing tool on himself. We all love new tech. Some of us love getting the bleeding edge, barely-on-the-market devices and some enjoy getting tech thirty years after the fact to revel in nostalgia. The similarity is that we assume we know what we’re buying and only the latter category expects used parts. But, what if the prior category is getting used parts in a new case? The University of Alabama in Huntsville has a tool for protecting us from unscrupulous manufacturers installing old flash memory. Flash memory usually lasts longer than the devices where it is installed, so there is a market for used chips which are still “good enough” to pass for new. Of course, this is highly unethical. You would not expect to find a used transmission in your brand new car so why should your brand new tablet contain someone’s discarded memory? The principles of flash memory are well explained by comparing them to an ordinary transistor, of which we are happy to educate you. Wear-and-tear on flash memory starts right away and the erase time gets longer and longer. By measuring how long it takes to erase, it is possible to accurately determine the age of chip in question. Pushing the limits of flash memory’s life-span can tell a lot about how to avoid operation disruption or you can build a flash drive from parts you know are used. If you’re really interested in aircraft and flying, there are many ways to explore that interest. There are models of a wide range of sizes and complexities that are powered and remote-controlled, and even some small lightweight aircraft that can get you airborne yourself for a minimum of expense. If you’re lucky enough to have your own proper airplane, though, and you’re really into open source projects, you can also replace your airplane’s avionics kit with your own open source one. Avionics are the electronics that control and monitor the aircraft, and they’re a significant part of the aircraft’s ability to fly properly. This avionics package from [j-omega] (who can also be found on hackaday.io) will fit onto a small aircraft engine and monitor things like oil temperature, RPM, coolant temperature, and a wide array of other features of the engine. It’s based on an ATmega microcontroller, and has open-source schematics for the entire project and instructions for building it yourself. Right now it doesn’t seem like the firmware is available on the GitHub page yet, but will hopefully be posted soon for anyone who’s interested in an open-source avionics package like this. The project page does mention that this is experimental as well, so it might not be advised to use in your own personal aircraft without some proper testing first. That being said, if you’ve heard that warning and have decided just to stay on the ground, it’s possible to have a great experience without getting in a real airplane at all.